During the education fair BETT in the UK these days, Microsoft have used it as an opportunity to preview a new digitizer aimed at the education market called the Microsoft Classroom Pen. Microsoft didn’t want to reveal all the details today, and says instead that they will announce more details on the coming Friday. 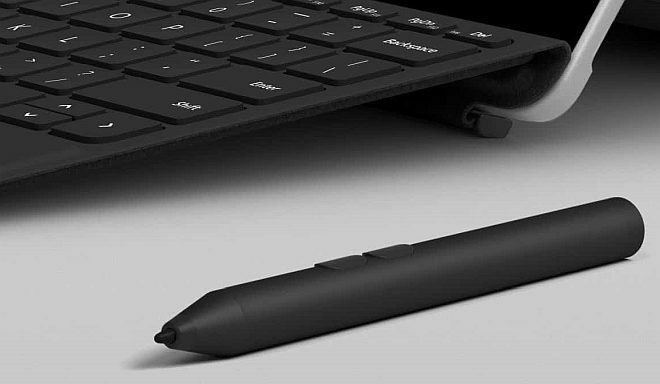 What have learned though, is that the Microsoft Classroom Pen is designed for K-8 students and schools that will handle more hard wear than the regular Surface Pen. It will come with a holder for the pen so that it wont just float around like the regular Surface Pen (which attach magnetically though), and the tip of the pen will be harder than that of the regular Surface Pen, so that it can withstand the daily wear and tear of highly energetic kids. The nibs are replaceable too of course, and an extra nib is included. The price is also half than that of the Surface Pen, costing $39.99 at piece, but you’ll have to team up with others or have a lot of kids if you want to buy the pen, because Microsoft will only sell them in 20-packs for $799.80. By the looks of, the new school stylus also looks to be quit a lot thicker than the Surface Pen, which is only natural since it’s intended for children’s hands.